As the war goes on and Whitebeard advances, this week’s episode focuses much more on Luffy’s situation. Exhausted, he keeps running, however he is stopped first by a vice-admiral, then by Admiral Kizaru himself. As he receives another light kick, his energy supply runs out and he falls, unable to move. 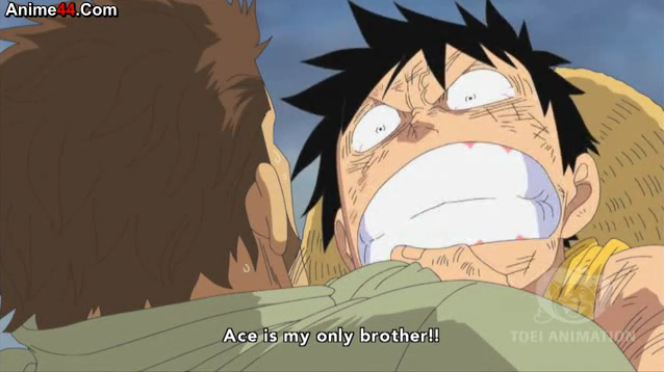 It only takes a moment, however, before he feels the need to get back up and keep going in order to save Ace. Gaining Whitebeard’s help, he is forced to lie down and be taken care of. Meanwhile, the war still goes on, and Marco has decided to go directly and fly to Ace in order to save him. However, he is stopped by vice-admiral Garp, who has finally decided to join the fray against his own grandson (Well they’re not related by blood or anything, but whatever you guys know what I mean…). As unsurprising as it may be, considering he has been like that every time, I am amazed at how much determination Luffy has. Even now, as his batteries are completely out, the only thing that goes through his mind is Ace’s life, and how he needs to save it. 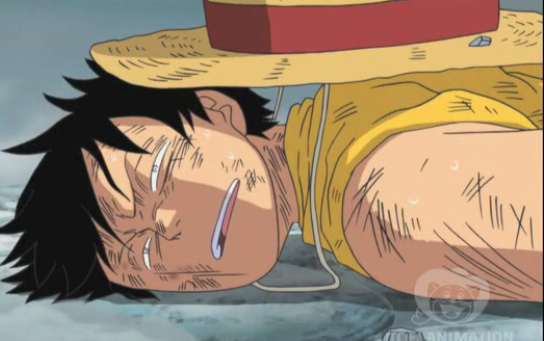 The scene where Luffy tries to reach Ace and falls down was really sad, and you could definitely feel the desperation he felt at the moment, how powerless he was. Marco’s move also surprised me very much, and I actually had hopes that he would get there and save Ace. Garp’s entrance was pretty amazing however, and I would definitely be scared of him, however I know what will happen and there is still hope. Yeah, that’s right. There is still hope! 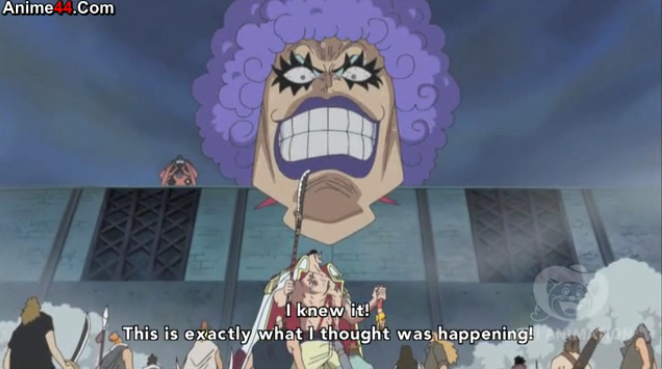 You know you're watching One Piece when you're in an intense, deadly battle, the main character's about to die, and you see something so utterly ridiculous as a gigantic head floating over a wall. P.S. : On a side note, I’ve realized, over the past few weeks that I have been blogging this, that for every single episode there was an amazing cliffhanger at the end. Seriously, when I think about it, that’s a pretty amazing feat. I just thought I’d mention it. I already love One Piece enough as it is, I just thought I needed to share a bit of the reason why. That’s all. Tagged Currently Covering, episode 476, one piece, review. Bookmark the permalink.